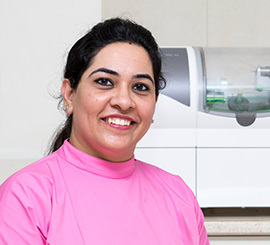 A graduate of Bharati Vidyapeeth, and a Postgraduate of DY Patil Dental College, Dr. Shivangi is an Endodontist (Root Canal Specialist) by training. She has been associated with The Sterling Dental Clinic since 2012. A member of Federation of Operative Dentistry of India, she is a highly trained and qualified endodontist whose area of speciality is cosmetic dentistry. She is proficient in the use of LASERS, microscopes to provide more precise treatment to the patients. SShe keeps herself updated with the new technology like Zoom Whitening &Cerec. Has few publications to her credit. Apart from dentistry, she is actively pursuing her interests in meditation, different forms of healing and is spiritually inclined.